We have all felt alone. That moment where we would give anything to know someone else who has walked the same path. That person who can give us the strength to make it to the other side. When we face our greatest challenge we should not be alone! The Joe Niekro Foundation™ Support Groups create a community to help these survivors know that recovery is possible and they are not alone. These groups provide life-saving support to patients, survivors, caregivers and families, both online and in person. Social support is essential to the recovery process and social isolation can greatly reduce patient recovery and outcomes after suffering a Brain Aneurysm/AVM/Hemorrhagic Stroke. Many hospitals are not equipped to offer patients and families the ongoing support post discharge needed for their full recovery. Survivors have the opportunity to meet and learn from other survivors who have experienced similar issues and understand. Support group members learn what to expect during their healing process and develop new coping strategies through shared personal experiences. Members have access to healthcare professionals as well as other survivors. Our education booklet Roadmap to Recovery provides information on topics such as depression, social reintegration, coping with disabilities, nutritional brainpower, exercising your brain and much more. Members feel empowered when they receive access to educational information and emotional support that directly helps lead them to improved health and quality of life. Share the message with 16 friends and/or share the link below with friends on other social media sites, across the web and by email. 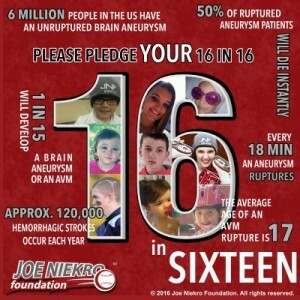 Please join us and pledge or share YOUR 16 in 16!